Online applications are invited by FSEZ Recruitment 2019. 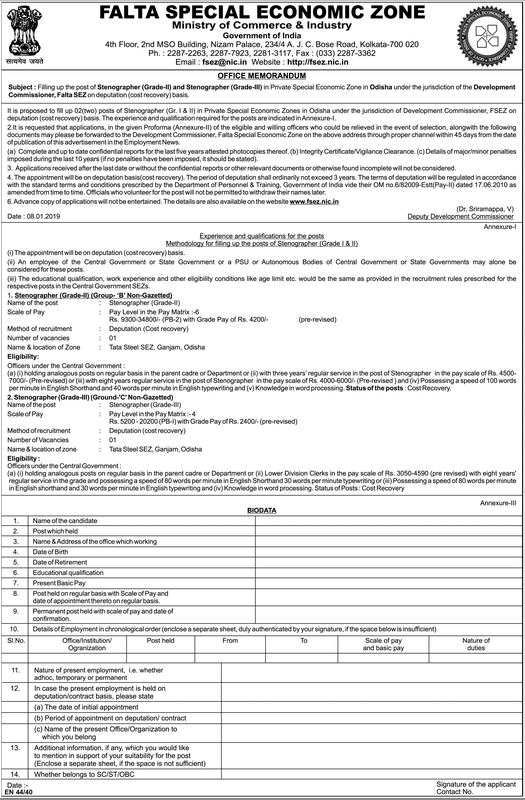 Interested candidates for Falta Special Economic Zone (FSEZ) Recruitment 2019 of 02 Stenographer (Grade-II) and Stenographer (Grade-III) Posts. Candidates Can Apply Through the Official Website www.delhimetrorail.com. Both Male and Female Can Apply Online For FSEZ Jobs. The Selection Process is based on Typing Test, Knowledge in word processing. The Selected candidates get pay Rs. 9300-34800 + Grade pay Rs.4200/-(Stenographer (Grade-II)), Rs. 5200-20200 + Grade pay Rs.2400/-(Stenographer (Grade-III).